On 3 July, the Trois-Rivie`res Port Authority (TRPA) and Groupe Somavrac announced the signing of a long-term agreement to operate Terminal 13 at the Port of Trois-Rivie`res. This terminal, with a surface area of 23,000m2, as well as Pier 13, was restored in 2016 and has been in operation since January 2017. This agreement allows Somavrac to expand its services. In addition to two vessel berths,Terminal 13 provides an outdoor storage area accommodating a wide variety of products. The terminal provides effective rail and road links along with a network of pipelines connected to reservoirs located further north. It also offers access to two solid bulk facilities located nearby. It has become a comprehensive multimodal storage platform. Gae´tan Boivin, President and CEO of the TRPA, is very pleased with the agreement with Somavrac. As he explained,“it strengthens our partnership with a company recognized for its excellence, and the Port of Trois-Rivie`res has always been able to rely on their quality and competitive logistics services. This agreement allows the Port of Trois-Rivie`res to continue providing high quality services to its users. The stability of the workforce is also assured with the signing in February of a nine- year collective agreement between the Maritime Employers Association and the Longshoremen’s Union”. Somavrac offers specialized services in the multimodal handling of bulk goods. Through its various maritime, rail and road accesses, Somavrac has the necessary resources to fulfill customer’s logistics activities in full or in part. The company’s services include stevedoring, warehousing, transportation, distribution, handling, bagging and transformation of goods. The new Terminal 13 strongly demonstrates the resolve of the Port of Trois-Rivie`res to put its customers first. It is an unprecedented modernization on the St. Lawrence River. From a logistical point of view, a new berth has been added. It augments the traffic movement areas, making them even more fluid and thereby minimizing waiting times. Unlike other berths in this sector, there are no warehouses nearby, which optimizes the loading and unloading of vessels. The Terminal benefits from a new 23,000m2 storage area served by two rails at the terminal. “With our resolve to satisfy customer needs, the configuration of the terminal has been optimized to accommodate different types of products in both solid bulk and general merchandise. Everything has been considered, whether in terms of calculating the slopes as well as the positioning of the lighting fixtures. The port can thus offer customers different value-added services in a safe and sustainable environment,” says David Berthelot, Business Development Coordinator at the Port of Trois-Rivie`res. The Port of Trois-Rivie`res’ primary objective is to be perceived as the ideal port solution for its users — including the cargo handlers and the shipping agents, the crews, the shippers and their freight forwarders. The port receives between 200 and 250 vessels a year, and is keen to provide a positive experience all round. The new terminal will allow it to accommodate more, but it knows too that it is important to receive vessels at the right docks, to optimize their passage through the port as it knows that this can have an impact throughout the handling chain. For the Port of Trois-Rivie`res, it is important that this impact be positive! In recent years, the port has paved the way in this area by adding infrastructures linked to port operations but also in terms of safety, security and the environment. Over ZAR 1,688m has been invested at the port in recent years. These investments have greatly benefited the solid bulk sector. Specifically, the railway infrastructure was completely redesigned, as was the railyard, thereby doubling its capacity. 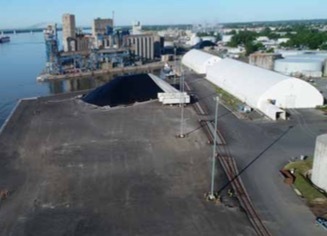 The acquisition of new storage areas and the addition of four new warehouses for various bulk type cargo demonstrate that the Port of Trois-Rivie`res has become the benchmark for a long sought-after multi-product customized approach. The port’s tenant Somavrac is recognized for offering new ways of operating to its customers in order to increase productivity including a new unloading platform in front of the new warehouses 24 and 25. The port is working closely with Somavrac, as well as with all its other customers, to identify innovative solutions to optimize productivity, whether through new infrastructures or processes, and also to reduce the environmental footprint of port activities. The Port of Trois-Rivie`res handles over three million metric tonnes of traffic and generates close to 900 direct jobs. It accommodates 55,000 trucks, 11,000 railcars and more than 200 merchant and cruise ships annually originating from over 100 different ports in more than 40 countries around the world.